The CD28-specific mAb TGN1412 rapidly caused a life-threatening “cytokine storm” in all six healthy volunteers in the Phase I clinical trial of this superagonist, signaling a failure of preclinical safety testing. We report novel in vitro procedures in which TGN1412, immobilized in various ways, is presented to human white blood cells in a manner that stimulates the striking release of cytokines and profound lymphocyte proliferation that occurred in vivo in humans. The novel procedures would have predicted the toxicity of this superagonist and are now being applied to emerging immunotherapeutics and to other therapeutics that have the potential to act upon the immune system. Data from these novel procedures, along with data from in vitro and in vivo studies in nonhuman primates, suggest that the dose of TGN1412 given to human volunteers was close to the maximum immunostimulatory dose and that TGN1412 is not a superagonist in nonhuman primates. A CD28-specific mAb, TGN1412, with claimed therapeutic potential for treating a variety of diseases, was subjected to the usual battery of safety tests that are normally applied to such “first time in humans” candidate therapeutics. The testing included in vitro experiments, in which cytokine responses to TGN1412 of human white blood cells, including purified lymphocytes, and white blood cells from other species were measured, and in vivo studies in Cynomolgus macaques. Once the preclinical safety testing had been completed and assessed, regulatory approval was given for TGN1412 from a pharmaceutical grade batch of the Ab to be injected into six volunteers, as part of a Phase I clinical trial in March 2006. All six recipients of the Ab suffered life-threatening severe adverse events, secondary to a “cytokine storm” (a cascade of proinflammatory cytokine release), and required weeks of hospitalization (1). The term cytokine storm was coined to describe a cascade of proinflammatory cytokines and the harmful responses that they evoke, including fever, pain, and organ failure due to hypotension (1). These responses were broadly similar to responses to bacterial endotoxin, but the TGN1412 used in the trial was found not to be contaminated with endotoxin in the highly sensitive bacterial endotoxins (Limulus) test (2). Analysis of the TGN1412 used in the trial was conducted at the National Institute for Biological Standards and Control (NIBSC) at the request of the U.K. Medicines and Healthcare Products Regulatory Agency (MHRA). This analysis, using a broad range of analytical techniques, showed that the TGN1412 complied with its specification and was of clinical grade. Additional testing revealed the TGN1412 to be free of “nonendotoxin” pyrogenic contaminants in a monocyte activation test for proinflammatory and pyrogenic contaminants (3, 4) and also in a rabbit pyrogen test (5). Also, the TGN1412 passed the pharmacopoeial test for abnormal toxicity using mice and guinea pigs (6). Following discussions with the MHRA and Prof. Sir Gordon Duff, Chairman, and other members of the Expert Scientific Group on Phase One Clinical Trials, as well as in-house considerations, a wider investigation of TGN1412, relevant to its safety evaluation and the safety of clinical trials, was conducted at NIBSC using cell-based procedures. This investigation had the following objectives: to investigate the mechanisms underlying the pathological responses to TGN1412, to gain additional information about the biological activities of this molecule, and to develop novel procedures to improve preclinical safety testing of immunomodulatory therapeutics. The results of this investigation and the conclusions drawn from the results obtained are described below. TGN1412 was dosed in human volunteers in mass units (milligrams per kilograms) and in preclinical in vivo and in vitro testing TGN1412 was also administered in mass units, usually milligrams per kilograms and micrograms per milliliter, respectively. One milligram of TGN1412 corresponds to ∼6.52 nmol, 1 μg corresponds to ∼6.52 pmol, and a 1 μg/ml solution of TGN1412 is ∼6.52 nM. TGN1412 was injected into volunteers at 0.1 mg/kg and into monkeys at up to the much higher dose of 50 mg/kg, i.e., 500× the human dose. The average male is 70 kg and has ∼5 liters of blood. Drug dissolves in plasma, which is ∼60% of the total blood volume and therefore the effective dilution volume is 3 liters. A dose of 0.1 mg/kg (human dose) × 70 kg = 7 mg of TGN1412 per 3 liters of plasma; 0.1 mg/kg (human dose) × 70 kg = ∼2 mg/L plasma; and 0.1 mg/kg (human dose) × 70 kg = ∼2 μg/ml plasma. It should be noted that 2 μg/ml is the maximum in vitro concentration “equivalent” to 0.1 mg/kg and does not take into account Ab half-life and preferential redistribution in one body compartment rather than another. The maximum dose given to macaques was 50 mg/kg = 500× more than that given in humans. The larger dose is approximately equivalent to 1000 μg/ml, subject to the caveats noted above. Therefore, in the present study, TGN1412 was tested in vitro at concentrations between 0.5 and 1000 μg/ml. TGN1412 was presented to human or Cynomolgus macaque PBMC or blood in a number of different protocols. These are described below and in Fig. 1⇓: (protocol 1) as an aqueous solution; (protocol 2) as an aqueous solution, in combination with aqueous anti-human Fc Ab; (protocol 3) wet coated directly onto the walls of the wells of 96-well polystyrene tissue culture plates; (protocol 4) Air dried directly onto the walls of the wells of 96-well polystyrene plates; (protocol 5) Wet coated onto an anti-human Fc Ab that had itself been air dried onto the walls of the wells of 96-well polystyrene plates; and (protocol 6) as an aqueous solution in the presence of a monolayer of cells originally derived from human endothelium. Diagrammatic representation of the six protocols used for presentation of TGN1412 to white blood cells. Protocols 1 and 2 were similar to the protocols used in the original preclinical safety testing. When these protocols failed to stimulate cells or evoke the cytokine release that had occurred in the human volunteers, additional protocols were devised and tested. Protocol 3 was tested because in ELISA the capture Ab is usually wet coated to immobilize it onto the plate. When this protocol failed to stimulate cells or evoke cytokine release, protocols 4–6 were devised to immobilize the TGN1412 in the hope that at least one of these different protocols would present the TGN1412 to cells in such a way that the TGN1412 provided an effective stimulus in vitro. In protocol 4, the Ab was completely dried onto plates in an attempt to effect stable and robust immobilization. Protocol 5 was a hybrid of protocols 3 and 4 and protocol 6 was an attempt to mimic the effect of an interaction of TGN1412 with endothelial cells because such an interaction may have occurred in the volunteers. PBMC cytokine release studies were conducted as described previously (3, 4). Briefly, PBMC were isolated using Lymphoprep (Axis-Shield) from human heparinized peripheral blood not more than 4 h after its collection. TGN1412 was incubated with 50,000–200,000 PBMC/well in 250 μl of supplemented RPMI 1640 culture medium and the donor’s own plasma (2% v/v). The culture was conducted, in quadruplicate, using aseptic conditions and using reagents and consumables that were sterile and pyrogen free, at 37°C, in 5% CO2 in humidified air for 16–72 h. The cytokine responses to TGN1412 were compared, using cytokine-specific ELISAs, with responses to appropriate positive and negative controls. The positive controls were bacterial endotoxin (LPS), the mitogenic CD3-stimulating mAb UCHT-1 (R&D Systems), and the lectin PHA. The negative control was an isotype-matched (IgG4) human mAb of irrelevant specificity. Readouts were TNF-α, IL-2, IL-6, IL-8, and IFN-γ. In some experiments, human peripheral blood (20% v/v) or peripheral blood from Cynomolgus macaques (20% v/v) was substituted for PBMC. In other experiments, PBMC (125,000 cells/well) were cultured over monolayers of endothelial cells originally derived from human umbilical vein (a monolayer of 30,000–68,000 cells/well) in 300 μl of supplemented RPMI 1640 culture medium and 2% (v/v) AB serum per well. The original source of the endothelial cells was HUVECs (pooled), purchased in 1999 from TCS Biologicals (product code ZHC-2101, batch 23203T), with stocks expanded in EGM-2 medium (Cambrex BioScience). Cells used in the coculture experiments were from one working cell bank, frozen at a total of 17 passages. Proliferative responses of human and Cynomolgus macaque lymphocytes were measured using a flow cytometry-based assay that uses a fluorescent membrane dye (PKH26) that is partitioned between daughter cells at division (7). Proliferation appeared as bands of labeled lymphocytes with reducing PKH26 fluorescence and increased forward scatter (size) by flow cytometry. Analysis software (Modfit LT; Verity Software House,) was used for mathematical deconvolution of daughter generations to provide a precursor frequency of responding cells in the parent population. Proliferative responses to TGN1412 and isotype-matched control IgG4 wet coated (at 1 μg/well) or air dried (at 0.1–200 μg/well) in U-bottom 96-well plates (BD Biosciences Labware) were assessed. Aqueous solutions of PHA (2 μg/well), mitogenic human CD3-stimulating Ab UCHT-1 (R&D Systems), nonmitogenic rhesus CD3 Ab (clone FN-18; Abcam), and conventional anti-human CD28 Ab (clone CD28.2; BD Biosciences), wet coated and air dried (at 2 μg/well), were used as positive controls. Briefly, PBMC were stained with the fluorescent membrane dye PKH26 (Sigma-Aldrich) at 2 × 10−6 M, washed, dispensed into 96-well plates in triplicate at 2 × 105 PBMC/well, maintained in 200 μl of RPMI 1640 medium supplemented with donor plasma, and incubated in a humidified incubator at 37°C with 5% CO2 for 72 h. Cells were then washed with PBS and fixed with 2% (v/v) paraformaldehyde in PBS. For phenotypic determination, lymphocytes were counterstained with anti-human CD4-allophycocyanin (BD Biosciences) before fixation. In additional studies, the effect of adding human sequence IL-2 (at 4 IU/well) to wells containing air-dried TGN1412 (at 1 μg/well), aqueous TGN1412 (at 1 μg/well, 30-min incubation followed by washing) captured with anti-human Fc Ab (Abcam) that had been air dried (at 1 μg/well), and aqueous TGN1412 plus an Ab specific for human Fc Ab (both at 1 μg/well) were evaluated. Triplicates were pooled for acquisition of 30,000 lymphocytes using a FACSCalibur flow cytometer (BD Biosciences). The phenotype of proliferating cells was analyzed using CXP software (Beckman Coulter). Activation responses of human and Cynomolgus macaque lymphocytes stimulated with air-dried TGN1412 (1–2 μg/well) for 3 days were assessed by up-regulation of CD25 (IL-2Rα chain) expression and flow cytometry. Briefly, lymphocytes were surface stained with anti-human CD25 PE (BD Biosciences) and anti-human CD4-allophycocyanin (BD Biosciences) for 20 min, washed, fixed, and acquired as described above. Culture supernatants were collected for measurement of IL-2 and IFN-γ by ELISA. Early cytokine responses of human and Cynomolgus macaque lymphocytes were assessed by intracellular cytokine staining and flow cytometry. Briefly, PBMC were stimulated in culture with either air-dried TGN1412 (at 0.4–200 μg/well), aqueous TGN1412 (at 1 μg/well, 30-min incubation followed by washing) captured with anti-human Fc Ab (Abcam) that had been air dried (at 1 μg/well), and aqueous TGN1412 with aqueous anti-human Fc Ab (both at 1 μg/well) or the mitogens (0.01 μg/well = 81 nM) and ionomycin (0.16 μg/well = 1 μM). Stimulation was conducted in 96-well plates in triplicate at 2 × 105 cells/well maintained in 200 μl of RPMI 1640 medium supplemented with donor plasma and incubated for 6 h in a humidified incubator at 37°C with 5% CO2. To inhibit protein secretion and allow intracellular accumulation of cytokines, brefeldin A (2 μg/well = 36 μM) was added to all wells at 1.5 h. After incubation, plates were transferred to a refrigerator (4°C) for overnight storage before staining. Lymphocytes were first surface stained with anti-human CD4-PE (BD Biosciences) and anti-human CD8-allophycocyanin (Invitrogen Life Technologies) for 20 min, washed (PBS containing 4% (v/v) FCS and 0.05% (w/v) sodium azide), fixed for 20 min (Fix and Perm, reagent A; Invitrogen Life Technologies), and washed. For intracellular cytokine staining, permeabilization reagent (Fix and Perm, reagent B; Invitrogen Life Technologies) and anti-human IL-2-FITC (BD Biosciences), anti-human TNF-α-PE (BD Biosciences) or anti-human IFN-γ-FITC (BD Biosciences) were added to wells and plates incubated for 30 min followed by two washes and resuspension of cells in 2% (v/v) paraformaldehyde in PBS. Triplicates were pooled for acquisition of 30,000 lymphocytes on a FACSCalibur flow cytometer (BD Biosciences) and analyzed using CXP software (Beckman Coulter). The rationale for the choice of doses of TGN1412 was as follows: 0.1 mg/kg was the dose administered to the six volunteers in the Phase I clinical trial and 5.0 and 50 mg/kg were the doses injected into Cynomolgus macaques in the preclinical safety testing; 0.5 mg/kg was chosen as an intermediate dose to fill in the dose-response curve between 0.1 and 5.0 mg/kg. In vivo studies were conducted in 12 Cynomolgus macaques. The animals were anesthetized and TGN1412 or diluent for TGN1412 (control) was administered by slow i.v. injection that mimicked the rate of administration in the clinical trial as closely as possible. Two macaques were injected i.v. with TGN1412 buffer (control) and two macaques were injected i.v. with each of the following doses of TGN1412: 0.1, 0.5, 5.0, and 50 mg/kg, using TGN1412 from a freshly opened vial of TGN1412. Additionally, two animals were injected with 0.1 mg/kg TGN1412 taken from a syringe that was recovered from the clinical trial and that was associated with the most severe adverse events. Anesthesia was maintained for 2 h after administration of TGN1412 to allow monitoring of blood pressure, heart rate, and core body temperature at hourly intervals. Blood samples taken at these times were for hematology, biochemistry, and liver function tests, cytokine release measurements, and pharmacokinetics. This allowed for detailed monitoring of any immediate adverse reactions. Twenty-four hours after administration of TGN1412, macaques were anesthetized for a peripheral lymph node biopsy to investigate any changes in lymphoid tissue lymphocytes and to provide blood samples for hematology, biochemistry, and liver function tests, cytokine release measurements and pharmacokinetics of TGN1412. A further blood sample was taken at day 3 or 4 for hematology and pharmacokinetics. Macaque studies were completed on day 7, blood samples were taken for testing, and tissues were removed for histopathology. The tissues examined were peripheral and mesenteric lymph nodes, jejunum, spleen, kidney, liver, pancreas, thymus, lung, heart, aorta, and pulmonary vein. TGN1412 (0.5–250 μg/well = 2.0–1000 μg/ml) added in aqueous solution and cultured for 16–24 h with human PBMC (50,000–200,000 PBMC/well) or human whole blood (20% v/v final concentration) did not stimulate the release of TNF-α, IL-6, and IL-8 above basal values and responses to negative controls. In contrast, TGN1412 (1.0 and 10 μg/well, but not 0.1 μg/well) air dried onto the walls of wells in which PBMC were then cultured for 16–24 h stimulated the release of TNF-α, IL-6, and, especially, IL-8 (1,734 ± 332 pg/ml TNF-α, 177 ± 54 pg/ml IL-6, and 35,011 ± 6,300 pg/ml IL-8 for 10 μg/well TGN1412; means ± SEMs, n = 11 donors.) The data were obtained in three independent experiments, each comprising PBMC from different donors: four, four, and three donors, respectively. Results for TNF-α and IL-8 are shown in Fig. 2⇓. Cytokine responses to immobilized TGN1412 of human PBMC. PBMC were cultured for 16–24 h with air-dried (immobilized) TGN1412 at the doses indicated and with an isotype-matched negative control and UCHT1-positive control. Values for TNF-α (upper panel) and IL-8 (lower panel) are means and SEs of the means of 11 donors of PBMC. The data were obtained in three independent experiments, each comprising PBMC from different donors: four, four, and three donors, respectively. When human whole blood at a final dilution of 20% (v/v) was substituted for PBMC, TGN1412 (1.0 and 10 μg/well, but not 0.1 μg/well) air dried onto the walls of wells in which 20% (v/v) human whole blood was then cultured for 24-h stimulated release of TNF-α, IL-6, and IL-8 (329 ± 159 pg/ml TNF-α, 931 ± 775 pg/ml IL-6, and 2372 ± 512 pg/ml IL-8 for 10 μg/well TGN1412; means ± SEM, n = 4 donors). In marked contrast, TGN1412 air dried onto the walls of wells failed to stimulate significant production of TNF-α, IL-6, and IL-8 from the diluted blood (20% v/v) of Cynomolgus macaques (<62.5 pg/ml TNF-α, <62.5 pg/ml IL-6, and <100 pg/ml IL-8 for TGN at 0.1, 1.0, and 10 μg/well, respectively; n = 4 donors). Despite its failure to respond to TGN1412, blood from Cynomolgus macaques responded to the positive controls of solutions of bacterial endotoxin (LPS, 1 endotoxin unit = 1 IU = 100 pg/ml) and PHA (90 μg/ml). The anti-human CD3 Ab UCHT1, which is not cross-reactive with Cynomolgus macaque CD3, did not trigger cytokine release. TGN1412 (0.1, 1.0, and 10 μg/well) added in aqueous solution to a coculture of PBMC and human endothelial cells and cultured for 24 h stimulated the release of TNF-α (143 ± 44, 189 ± 46, and 162 ± 36 pg/ml TNF-α for 0.1, 1.0, and 10 μg/well TGN1412, respectively; means ± SEM, n = 9 donors), IL-6 (296 ± 104, 542 ± 196, and 385 ± 131 pg/ml IL-6 for 0.1, 1.0, and 10 μg/well TGN1412, respectively; means ± SEMs, n = 9 donors), and IL-8 (7,822 ± 2201, 11,295 ± 2,842, and 9,550 ± 2,256 pg/ml IL-8 for 0.1, 1.0, and 10 μg/well TGN1412, respectively; means ± SEMs, n = 9 donors.) The data were obtained in three independent experiments, each comprising PBMC from different donors: three, two, and four donors, respectively. Results for TNF-α and IL-8 are shown in Fig. 3⇓. 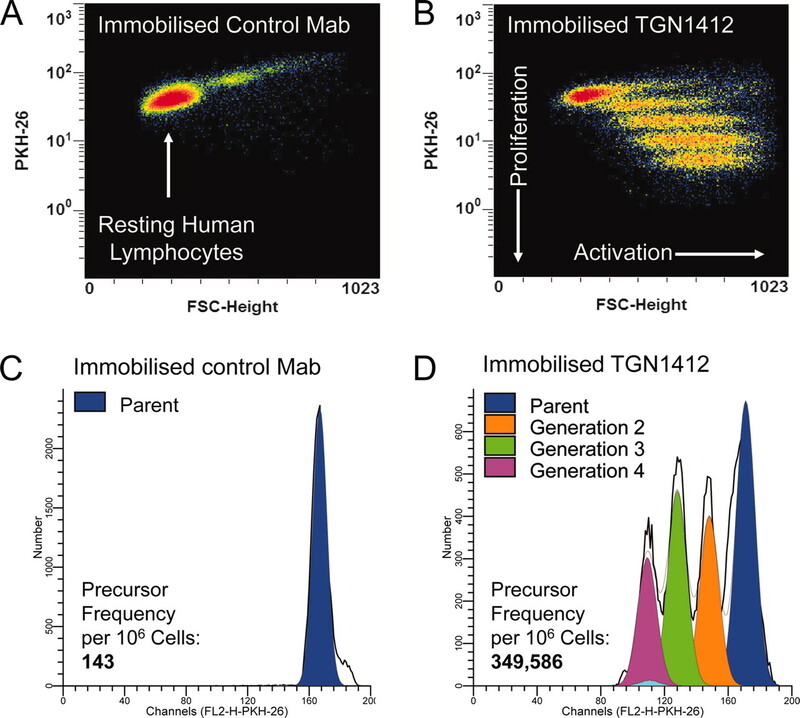 Cytokine responses to TGN1412 of human PBMC in the presence of human endothelial cells. 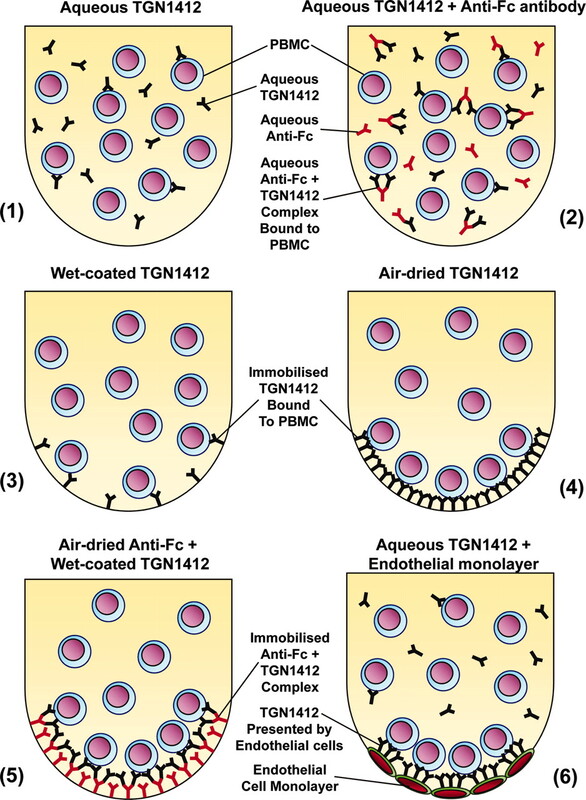 PBMC were cultured over monolayers of endothelial cells (originally derived from human umbilical vein) for 16–24 h with TGN1412 at the doses indicated and with an isotype-matched negative control and UCHT1-positive control. Values for TNF-α (upper panel) and IL-8 (lower panel) are means and SEs of the means of nine donors of PBMC. The data were obtained in three independent experiments, comprising PBMC from three, two, and four different donors, respectively. The results of the above experiments are representative of the results of other independent experiments conducted with cells or blood from other donors but using different cell densities, incubation times, or other changes in experimental conditions. A significant immunostimulatory response to TGN1412 in vitro was first observed using a flow cytometry-based proliferation assay and immobilized Ab. Pronounced proliferation of human lymphocytes incubated with immobilized TGN1412 was clearly evident compared with immobilized isotype-matched control Ab (Fig. 4⇓, A and B). In contrast, TGN1412 in aqueous solution, wet coated onto plates or cross-linked in aqueous solution with an anti-human Fc Ab, did not stimulate any significant proliferation of human lymphocytes. Analysis of lymphocyte proliferation, quantified as precursor frequency of responding cells per 106 lymphocytes (Fig. 4⇓, C and D), showed that immobilized TGN1412 stimulated proliferative responses in up to 35% of lymphocytes. Phenotypic analysis of proliferating lymphocytes identified CD4+ T cells as the principle responding population (∼85% of proliferating cells), there eventually being no resting CD4+ T cells remaining. The level of proliferation induced by immobilized TGN1412 was profound and equivalent to the responses observed with the stimuli used as positive controls: PHA and mitogenic anti-CD3 Ab alone and in combination with conventional anti-CD28. 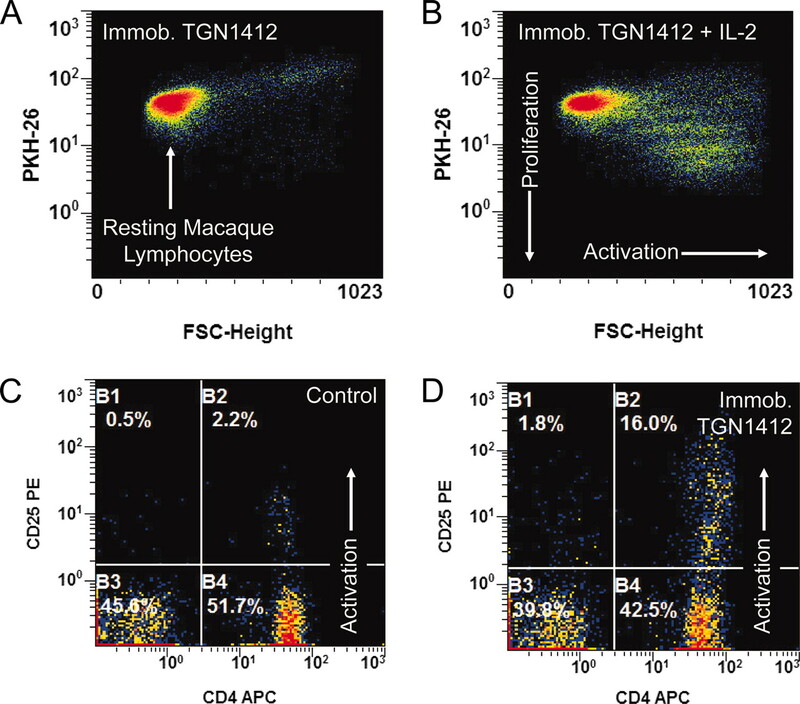 Even greater human lymphocyte proliferative responses were achieved with TGN1412 captured in aqueous phase by immobilized anti-human Fc Ab, suggesting that the responses measured with air-dried TGN1412 may have been an underestimation of the magnitude of the maximum achievable response using TGN1412. Proliferation of PKH26-stained human lymphocytes incubated for 3 days with 1 μg/well immobilized isotype control Ab (A) vs 1 μg/well immobilized TGN1412 (B). Lymphocyte proliferation appears as bands of cells with decreasing PKH26 fluorescence and increased size corresponding to increased forward scatter (FSC). A strong human lymphocyte proliferative response to immobilized TGN1412 was evident compared with immobilized isotype control Ab. Analysis software was used for deconvolution of daughter generations to calculate a precursor frequency of responding cells in the parent population following stimulation with immobilized isotype control Ab (C) vs immobilized TGN1412 (D). A precursor frequency of 143 was obtained with isotype control Ab vs a precursor frequency of 349,586 per 106 human lymphocytes with TGN1412. In stark contrast, Cynomolgus macaque lymphocytes showed very little proliferative response to immobilized TGN1412 (Fig. 5⇓A), although they did proliferate in response to immobilized TGN1412 when recombinant human IL-2 (4 IU/well) was added to the cultures (Fig. 5⇓B). However, the responses of Cynomolgus macaque lymphocytes to immobilized TGN1412 plus IL-2 were only ∼10% of the responses of human lymphocytes to immobilized TGN1412 alone or of Cynomolgus macaque lymphocytes stimulated with mitogen, including a combination of rhesus anti-CD3 and conventional anti-CD28 Ab. Addition of IL-2 to human lymphocytes stimulated with immobilized TGN1412 did not increase the proliferative response, and IL-2 alone did not stimulate proliferation of human or Cynomolgus macaque PBMC. In subsequent studies, rhesus CD3 Ab in combination with immobilized TGN1412, but not alone, stimulated much stronger proliferative responses in Cynomolgus macaque lymphocytes, responses that were equivalent to the responses to mitogen. A and B, Proliferation of PKH26-stained macaque lymphocytes incubated for 3 days with 1 μg/well immobilized TGN1412 (A) vs 1 μg/well immobilized TGN1412 plus 4 IU/well recombinant human IL-2 (B). Lymphocyte proliferation appears as bands of cells with decreasing PKH26 fluorescence and increased size which corresponds to increased forward scatter (FSC). No macaque lymphocyte proliferative response to immobilized TGN1412 alone was observed unless IL-2 was added to the wells. C and D, Activation of macaque lymphocytes stimulated with 1 μg/well immobilized TGN1412 for 3 days. Compared with negative control (C), immobilized TGN1412 (D) strongly up-regulates expression of the activation marker CD25 (IL-2Rα) on macaque CD4+ lymphocytes even though they do not undergo proliferation unless IL-2 is added to the cultures. Stimulation of human lymphocytes with immobilized TGN1412 was accompanied by significant up-regulation of the activation marker CD25 (IL-2Rα) and proliferation. Stimulation of macaque lymphocytes with immobilized TGN1412 similarly induced significant up-regulation of the activation marker CD25 on CD4+ T cells compared with controls (Fig. 5⇑, C and D), but in contrast to human lymphocytes this was not accompanied by proliferation. Stimulation of human lymphocytes with immobilized TGN1412 for 6 h resulted in significant production of IL-2 by CD4+ lymphocytes compared with controls (Fig. 6⇓, A and B). The level of IL-2+ lymphocytes was equivalent to the response seen with the combined stimulation of PMA and ionomycin. Immobilized TGN1412 also stimulated IFN-γ production by CD4+ human lymphocytes. However, the IFN-γ response was overall much smaller than that observed with the mitogens PMA and ionomycin, which stimulated ∼5- to 10-fold more CD8+ lymphocytes to produce this cytokine. 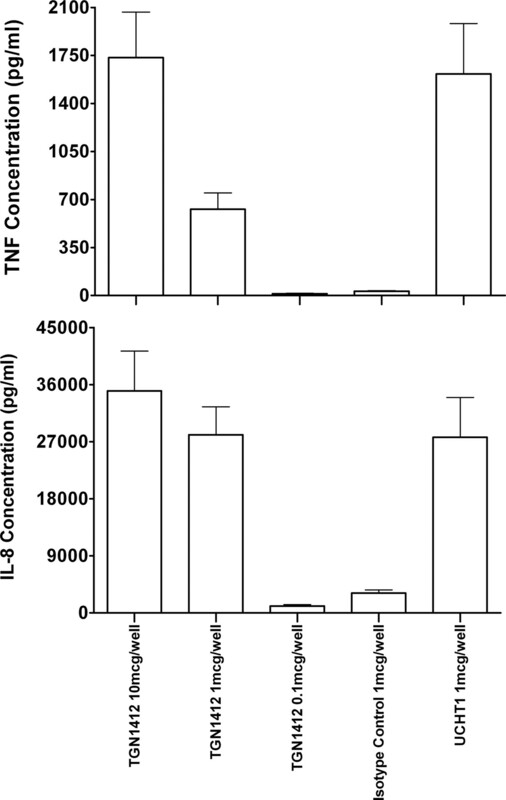 Even higher levels of IL-2+ human lymphocytes were obtained with TGN142 captured in aqueous solution by immobilized anti-human Fc Ab compared with controls (Fig. 5⇑, C and D), suggesting that the responses measured with air-dried (immobilized directly onto the plate) TGN1412 may be an underestimation of the magnitude of the maximum achievable response. In subsequent studies, we have confirmed that all of these IL-2+ human lymphocytes are also positive for TNF-α, following stimulation with immobilized TGN1412. 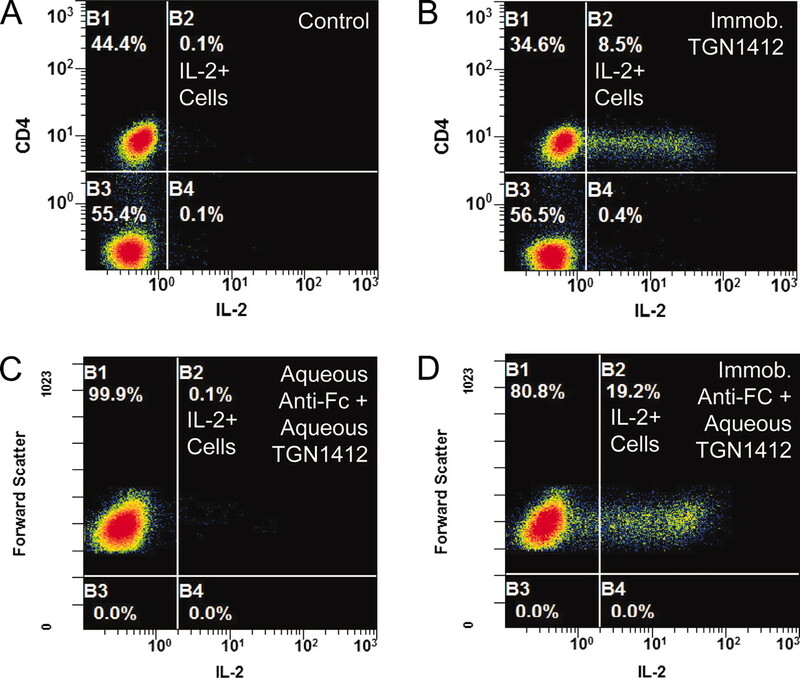 Intracellular cytokine staining of human lymphocytes for IL-2 following a 6-h stimulation with (A) negative control, (B) 1 μg/well immobilized TGN1412, (C) a combination of 1 μg/well aqueous TGN1412 and 1 μg/well aqueous anti-human Fc Ab, (D) 1 μg/well aqueous TGN1412 captured by 1 μg/well immobilized anti-human Fc Ab. Lymphocytes in A and B, but not C and D, have been counterstained with anti-CD4-allophycocyanin shown on the y-axis. Forward scatter (size) is shown on the y-axis of C and D. Compared with negative control (A), a large proportion of human CD4+ lymphocytes, equivalent to mitogen stimulation, produced IL-2 when stimulated with immobilized TGN1412 (B). Human lymphocytes stimulated with a combination of aqueous TGN1412 and aqueous anti-Fc Abs did not produce IL-2 (C). 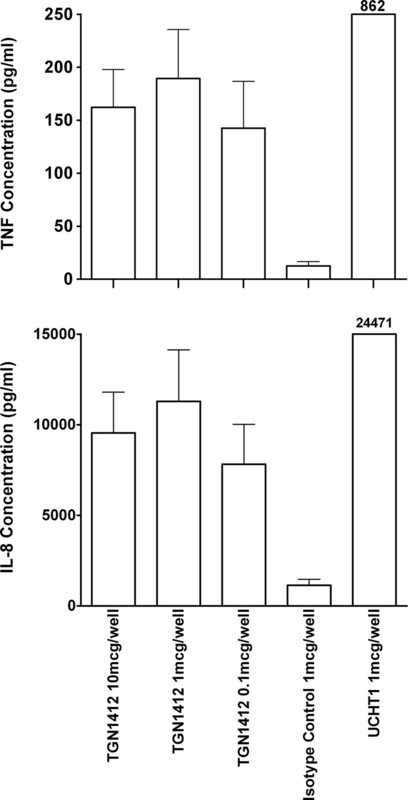 In contrast, human lymphocytes stimulated with aqueous TGN1412 captured by immobilized anti-Fc Ab stimulated greater IL-2 production than observed with immobilized TGN1412 alone (D). Measurement of proliferative responses of human lymphocytes to immobilized TGN1412 identified the optimal dose response as between 0.4 and 2 μg/well (Fig. 7⇓A). With higher doses of 20 or 200 μg/well, approximately equivalent to the doses (5 and 50 mg/kg) previously tested in Cynomolgus macaques, only weak proliferative response of human lymphocytes were observed. In contrast, with 0.4 μg/well TGN1412, approximately equivalent to the human dose administered in the clinical trial, a strong proliferative response of human lymphocytes was observed. 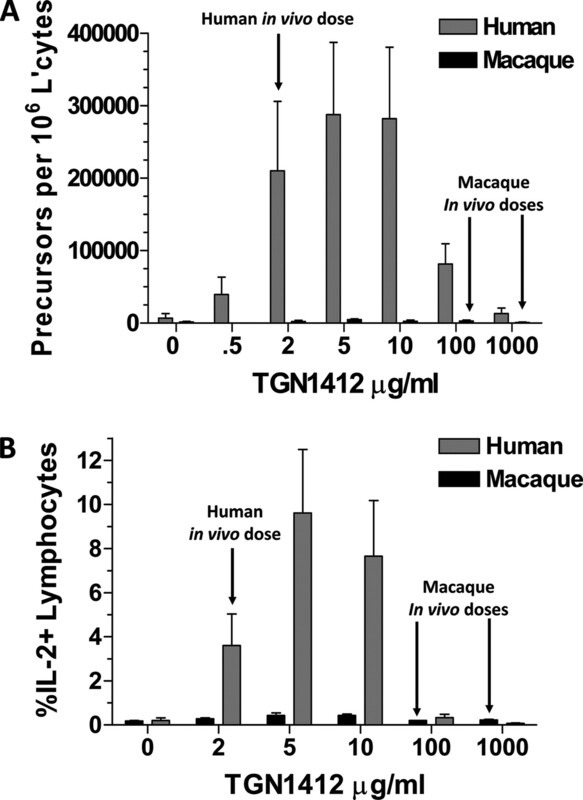 Dose responses of human and macaque lymphocytes to immobilized TGN1412. A, Proliferation of lymphocytes expressed as precursor frequency of responding cells per 106 lymphocytes after a 3-day incubation. Peak dose response for human lymphocytes was between 0.4 and 2 μg/well (2–10 μg/ml). For human proliferative responses, n = 8. For macaque proliferative responses, n = 8. The data were obtained in two independent experiments. B, Percentage of lymphocytes positive for IL-2 after a 6-h incubation. Peak dose response for human lymphocytes was between 0.4 and 2 μg/ml (2–10 μg/ml). For human IL-2 responses, n = 4. For macaque IL-2 responses, n = 4. Values are means and SEs of the means. For IL-2 production measured by intracellular cytokine staining, the optimal dose response of human lymphocytes to immobilized TGN1412 was between 0.4 and 2 μg/well (Fig. 7⇑B). ELISA data for supernatants from 3-day cultures of human lymphocytes stimulated with immobilized TGN1412 confirmed high levels of IL-2 and lower levels of IFN-γ in response to TGN1412 at low (0.4 to 2 μg/well) but not high (20 and 200 μg/well) concentrations of TGN1412. Although very low levels of intracellular IL-2+ cells were detected in Cynomolgus macaque lymphocytes stimulated with immobilized TGN1412 (at 1 μg/well) for 6 h, day 3 culture supernatants were negative for IL-2 measured by ELISA. In contrast, all PHA-stimulated human lymphocyte day 3 culture supernatants were positive for IL-2 and IFN-γ by ELISA. At all doses of TGN1412 administered to Cynomolgus macaques no observable adverse reaction was observed in terms of general health, blood pressure, heart rate, temperature, hematology, biochemistry, and liver function. Myocarditis was observed in one animal in the control group and variable cardiac hypertrophy in some others, but no lesions that would correlate with the severe complications seen in the volunteers at the clinical trial were detected. Also, there were no adverse reactions in Cynomolgus macaques following administration of syringe-derived material at the human dose (0.1 mg/kg): the “syringe-derived material” was the solution of TGN1412 recovered from the syringe contents given to the most severely affected clinical trial participant. In 1999, it was stated that in vivo superagonistic CD28-specific mAbs do not trigger a toxic cytokine storm and, as recently as 2005, that the lymphocytosis induced by CD28 superagonists appears to be benign and well tolerated (8, 9). In 2006, these statements were contradicted when all six recipients of the CD28-specific mAb TGN1412 suffered life-threatening severe adverse events as a consequence of just such a cytokine storm (1). As described by Suntharalingam et al. (1), adverse drug reactions began within 1 h with the volunteers experiencing headache and lumbar myalgia. Persistent high fevers and multiorgan failure were symptoms of systemic inflammatory responses with two of the six volunteers suffering from multiorgan failure for 9 and 16 days, respectively. Why did the preclinical safety testing of TGN1412, which included testing in Cynomolgus macaques, fail to predict the potent cytokine-inducing and proliferative properties of this molecule when given in humans? In answer to this question, our study first provides convincing evidence that the in vitro protocols used before the present study failed to predict toxicity in vivo because they did not present the Ab to white blood cells in a manner that mimicked its presentation in vivo. In the earlier in vitro studies, i.e., before the clinical trial, TGN1412 was simply added to white blood cells or cross-linked via its Fc region in aqueous solution, protocols that failed to stimulate release of cytokines and cell proliferation in the preclinical testing (10) and in the studies reported here. Second, we show that TGN1412 evokes cytokine release and lymphocyte proliferation in vitro only when presented to PBMC in the effective manner identified in these studies and hypothesize that specific and/or nonspecific binding of TGN1412 to cell surfaces is a requirement for TGN1412-stimulated activation of lymphocytes and a prerequisite for the triggering of the cytokine storm that occurred in volunteers who received TGN1412. Third, we show that white blood cells from Cynomolgus macaques do not respond to TGN1412 in the same way as human white blood cells, whether the cells are stimulated in vitro, using immobilized TGN1412, or in vivo. Essentially, TGN1412 is superagonistic in humans but not in Cynomolgus macaques. With regard to the second finding, when immobilized by drying (with warm air) onto wells of 96-well plates, captured by immobilized anti-Fc Ab, or presented via a mechanism involving the participation of an endothelial cell monolayer, TGN1412 stimulated substantial release of cytokines, including TNF-α, IL-2, IL-6, IL-8, and IFN-γ, and evoked a profound proliferation of human CD4+ lymphocytes in vitro. Our in vitro proliferative responses to TGN1412 exhibited a bell-shaped dose-response curve, with a maximum response to a concentration of TGN1412 that we calculate to be approximately equivalent to the dose of 0.1 mg/kg given to the human volunteers. Obviously, this calculation relies upon an extrapolation from an in vivo dose to an in vitro concentration and, more fundamentally, from an in vivo study in humans to an in vitro study using isolated human white blood cells. However, the dose of TGN1412 given to volunteers in the clinical trial (0.1 mg/kg) would appear to have been close to the maximum immunostimulatory dose for lymphocyte proliferation. Consistent with our data, the superagonistic mouse anti-human CD28 mAb 5.11A1, from which TGN1412 was engineered, markedly stimulated human T cell proliferation in vitro, with a bell-shaped dose-response curve (11), and with a maximum immunostimulatory dose that we calculate (with the caveats noted above) to be approximately equivalent to the in vivo dose given to human volunteers. With regard to the third finding, in contrast to the potent effects of immobilized TGN1412 on human white blood cells described above, in vitro Cynomolgus macaque lymphocytes did not proliferate when stimulated with immobilized TGN1412 unless IL-2 or rhesus CD3 Ab was added to cultures. However, macaque lymphocytes were activated by immobilized TGN1412 (as shown by the up-regulation of IL-2R expression and blast transformation), confirming binding to and interaction with macaque CD28. Thus, the profound difference in responses of human and macaque lymphocytes to immobilized TGN1412 appears to take place at the level of cell signaling pathways, because TGN1412 binds avidly to and activates CD28+ lymphocytes from Cynomolgus macaques. As previously reported, human and Cynomolgus macaque CD28 extracellular domains are 100% identical, but this may not exclude functional differences (12). Moreover, macaque CD28 differs from human CD28 in three transmembrane residues and it has been suggested that this could alter associations with molecular partners (13). One explanation that has been proposed for the different sensitivities of human and monkey lymphocytes to TGN1412 is the lack of immunoinhibitory Siglec expression by human, but not monkey, T cells (Ref. 14 and T. Hanke, http://www.dh.gov.uk/en/Publicationsandstatistics/Publications/PublicationsPolicyAndGuidance/DH_063117). This explanation is based upon enhancement of weak chimpanzee T cell responses to anti-CD3 and anti-CD28 costimulation after anti-Siglec-5 Ab treatment, but is not supported by our finding that anti-CD3 and anti-CD28 costimulation strongly stimulate both human and Cynomolgus macaque lymphocytes. Our in vitro data for Cynomolgus macaque white blood cells are entirely consistent with the data obtained in our new in vivo study in which the original in vivo preclinical study in Cynomolgus macaques that failed to predict the toxicity of TGN1412 was repeated and extended. TGN1412 injected into Cynomolgus macaques at the doses (5 and 50 mg/kg) used in preclinical testing and also at 0.1 and 0.5 mg/kg was well tolerated in these nonhuman primates. The 0.1-mg/kg dose was the (toxic) dose injected in the human volunteers and the 0.5-mg/kg dose was chosen to span the gap in the dose-response curve in the earlier study. The striking difference between human and Cynomolgus macaques in terms of the in vivo toxicity of TGN1412 is, we believe, a consequence of the very different way in which white blood cells from humans and macaques respond to TGN1412. At present, it is not known which T cell subsets, if any, are in involved in regulating the different responses of human and macaque T lymphocytes that we report here. In summary, our data indicate that, in contrast to humans, TGN1412 is not a superagonist in Cynomolgus macaques and suggest caution when interpreting negative data from preclinical testing of immunomodulatory therapeutics, even when testing has been conducted in nonhuman primates. The in vitro methods we describe are beginning to be applied to novel immunotherapeutics and other therapeutics that have the potential to act upon the immune system. We thank the staff at the Royal Veterinary College (Hertfordshire, U.K.) for performing hematology, biochemistry, liver function, and histopathology studies on the Cynomolgus macaques. We thank Dr. Stephen Inglis (Director, NIBSC, and Prof. Sir Gordon Duff, Chairman of the Expert Scientific Group on Phase One Clinical Trials) for helpful discussions before and during the preparation of this manuscript. ↵1 The contribution of C.E. was to regenerate and analyze flow cytometry data using human white blood cells. Suntharalingam, G., M. R. Perry, S. Ward, S. J. Brett, A. Castello-Cortes, M. D. Brunner, N. Panoskaltsis. 2006. Cytokine storm in a Phase 1 trial of the anti-CD28 monoclonal antibody TGN1412. N. Engl. J. Med. 355: 1018-1028. 2.6.14. Bacterial endotoxins. European Pharmacopoeia 5th Ed.2005161-165. Council of Europe, Strasbourg, France. Poole, S., Y. Mistry, C. Ball, R. E. Gaines Das, L. P. Opie, G. Tucker, M. Patel. 2003. A rapid ‘one-plate’ in vitro test for pyrogens. J. Immunol. Methods 274: 209-220. Gaines Das, R. E., P. Brügger, M. Patel, Y. Mistry, S. Poole. 2004. Monocyte activation test for pro-inflammatory and pyrogenic contaminants of parenteral drugs: test design and data analysis. J. Immunol. Methods 288: 165-177. 2.6.8. Pyrogens. European Pharmacopoeia 5th Ed.2005152 Council of Europe, Strasbourg, France. 2.6.9. Abnormal toxicity. European Pharmacopoeia 5th Ed.2005152 Council of Europe, Strasbourg, France. Givan, A. L., J. L. Fisher, M. Waugh, M. S. Ernstoff, P. K. Wallace. 1999. A flow cytometric method to estimate the precursor frequencies of cells proliferating in response to specific antigens. J. Immunol. Methods 230: 99-112. Rodriguez-Palmero, M., A. Franch, M. Castell, C. Pelegri, F. J. Perez-Cano, C. Kleinschnitz, G. Stoll, T. Hunig, C. Castellote. 2006. Effective treatment of adjuvant arthritis with a stimulatory CD28-specific monoclonal antibody. J. Rheumatol. 33: 110-118. Beyersdorf, N., T. Hanke, T. Kerkau, T. Hunig. 2005. Superagonistic anti-CD28 antibodies: potent activators of regulatory T cells for the therapy of autoimmune diseases. Ann. Rheum. Dis. 64: (Suppl. 4):iv91-iv95. Hanke, T.. 2006. Lessons from TGN1412. Lancet 368: 1569-1570. Luhder, F., Y. Huang, K. M. Dennehy, C. Guntermann, I. Muller, E. Winkler, T. Kerkau, S. Ikemizu, S. J. Davis, T. Hanke, T. Hunig. 2003. Topological requirements and signaling properties of T cell-activating, anti-CD28 antibody superagonists. J. Exp. Med. 197: 949-953. Ohresser, M., D. Olive, B. Vanhove, H. Watier. 2006. Risk in drug trials. Lancet 368: 2205-2206. Kenter, M. J., A. F. Cohen. 2006. Establishing risk of human experimentation with drugs: lessons from TGN1412. Lancet 368: 1387-1391. Nguyen, D. H., N. Hurtado-Ziola, P. Gagneux, A. Varki. 2006. Loss of Siglec expression on T lymphocytes during human evolution. Proc. Natl. Acad. Sci. USA 103: 7765-7770.